Gone are the days when basic colors such as red, yellow, and blue are, well, simple and basic. They have now evolved into so many shades which are probably beyond our imagination – giving us tons of choices for dresses and other items in our closets. I am sure you will all agree that one of the favorite and popular color choices for any clothing item is blue. The best thing about the color blue, in general, is that it could translate to different things depending on the shade used. A light shade could show off femininity while a dark shade could show off strength. Bright shades of blue can exude fun, while lighter ones shows calmness. Dark ones are definitely associated with firmness. Thus, this color is perfect for dresses no matter what your preference is or whatever occasion you might be gracing. Given such color, choosing for the perfect shade for a prom dress or for a dress to be used in any other special occasion is still vital. Normally, we would pick a shade of dress depending on our mood or preference. Generally, blue goes well with all skin tones so it is not so hard to pick out a shade of blue that would be perfect for you. However, I suggest navy blue dresses for those occasions which are more formal. It is not as dark as black, but it is not as light and informal as any other bright color. On the other hand, light blue dresses are perfect for occasions which are more relaxed. Therefore, they would be perfect for proms and similar occasion. 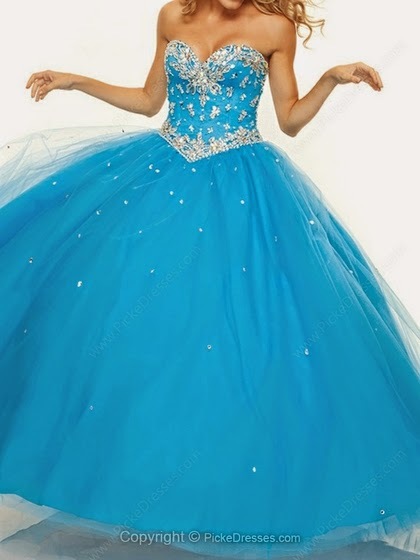 Likewise, the design of such blue prom dresses could add more detail and story to such. Dresses with cutouts of course add up sexiness to the entire look. On the other hand, ball gowns exude more elegance and give one an instant princess-like look. Mini dresses give that fun vibe and more relaxed look. Picking out that perfect blue prom dress is now easy with Pickedresses.com. They have tons of shades to choose from such as baby blue, bright blue, navy blue, and more! Also, they carry different designs that will surely match your taste and preference. The best thing about shopping at Pickedresses is that you could save a lot. Designer-like dresses with great quality for an affordable price is definitely the perfect choice you could have. For more styles of blue prom dresses, check out Pickedresses.com.